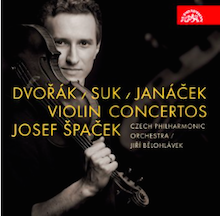 June 23, 2015, 10:55 AM · Just last April, on the Supraphone label Czech violinist, Joseph Spacek, released a recording of three significant Czech Concertos by composers Suk, Janacek and Dvorak. Czech music originates from traditional folk tunes which is pretty much the case for all European music. Smetana is considered the father of authentic Czech classical music. He thoroughly assimilated the country's popular melodies and in so doing forged a specific musical language, which expresses the very soul and sensibility of the Czech people. He had a profound influence on Dvorak, who himself became a brilliant representative of this school. Likewise Dvorak strove to improve and expand Smetana’s ideology. In a similar way Janacek was also a master of Smetana's point of view translating the work of his predecessors in the late romantic period. Spacek was a student both at the Curtis Institute of Music and at the Juilliard School. He has also studied and performed both in Europe and America. Our discussion of the differences of the music scenes of the two continents was most intriguing. Surprisingly, when compared to Europe the United States actually constitutes a very small market for classical music. When you look at Europe every city has an orchestra, sometimes many. Prague is a good example. A city with a population of 1.2 million, it has four symphony orchestras. Spacek considers himself a more all around player than as a specialist of any particular composer or period. “But it’s hard to say because in a few years I may be leaning toward some period. Maybe I will be the Czech violin repertoire expert, who knows? For now there is an enormous amount of Czech repertoire that is not played abroad and I feel like it’s my responsibility to bring it to the audience. It’s important that these works are heard. There is a lot of Czech music that is great but needs to be constantly re- introduced in order to remind the public of its great beauty."